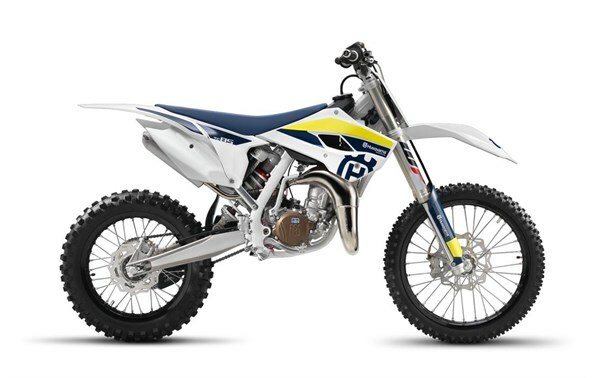 Click the button below to add the 2017 Husqvarna TC 85 19/16 to your wish list. Engine: The high performance 2-stroke engine on the TC 85 features a power valve to maximise the power band and is mated to a 6-speed gearbox and a Formula hydraulic clutch for smooth and precise shifting. Cylinder: The high performance cylinder has flow-optimised ports and an exhaust control valve for top performance. Crankshaft: The crankshaft of the TC 85 is optimised for maximum performance while guaranteeing durability. Frame: The chromoly steel frame and lightweight aluminium rear subframe combine to offer unrivalled precision and rider confidence. Rear subframe: The bolt-on aluminium rear subframe is perfectly matched to the lightweight feeling of the TC 85. Swingarm: The single-component casting process eliminates welding and guarantees consistent behaviour and quality. Strong but light, the beautifully styled aluminium cast swing arm provides perfect stability and safety. Tyres: Maxxis tyres that deliver outstanding performance on a variety of terrain are fitted as standard. The pattern design and rubber compound deliver exceptional straight-line stability and excellent traction and predictability. Brakes: A Formula four piston brake caliper and 220mm wave disc at the front, and a two piston caliper and 210mm wave disc at the rear, offer superior stopping power and feeling. Ergonomics: Tightly wrapped around the engine and frame, Husqvarna's bodywork is designed to connect the rider's body to the bike, for a perfect fit of man and machine, allowing for total control in all conditions for the most diverse body sizes. Distinctive looks: New colours and graphics evolve the looks of the TC 85.